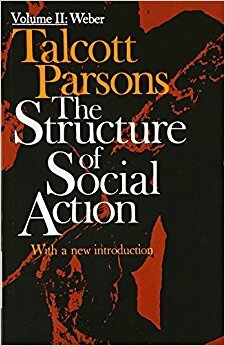 245 1 4 %a The structure of social action : %b a study in social theory with special reference to a group of recent european writers : [with a new introduction]. %n Volume 2, %p Weber / %c Talcott Parsons. 260 # %a New York : %b The Free Press ; %a London : %b Collier Macmillan Publishers, %c 1968. 300 %a XXVIII, Strony 474-775, LXI ; %c 21 cm. 504 %a Bibliografia na stronach XXXI-XXXVII oraz w przypisach. Indeks.